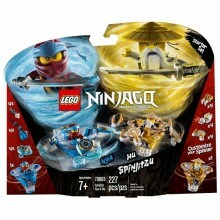 Double the Spinjitzu action with LEGO® NINJAGO® 70663 Spinjitzu Nya & Wu! This ninja toy features Nya’s Spinjitzu Tornado of Water spinner and Wu’s Spinjitzu tornado spinner, each with a new-for-January-2019 LEGO NINJAGO spinner element and 3 attachments for attack, defense and speed modes. Experiment with different techniques, create your own challenges and compete against your friends—the possibilities are endless. This creative toy building set includes Nya and Wu minifigures with katanas, plus 6 buildable display racks for attachment weapons and elements.